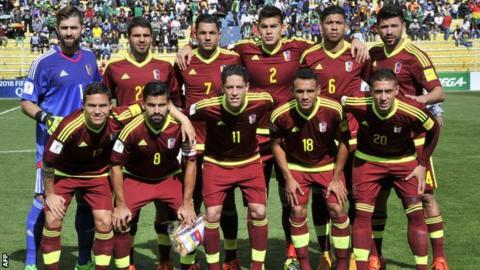 West Brom striker Salomon Rondon is among 15 Venezuela players who have threatened to quit unless their federation's (FVF) directors resign. The group is upset with how they "have been treated" and how "the World Cup qualifying project has been managed". It added: "We cannot carry on in an atmosphere damaged by the directors." Venezuela, the only South American team not to reach a World Cup finals, are bottom of their qualifying group for 2018 with zero points from four games. The players criticised FVF president Laureano Gonzalez for accusing them last week of planning to have coach Noel Sanvicente sacked. "We accept criticism of our performances and as a team take responsibility for the results but in no way do we accept that we were preparing a movement to get the national coach out," said the statement released on a social media. "We are upset and disillusioned by the lack of support from the national team's coaching staff over these accusations." The current board has been in power since former president Rafael Esquivel was arrested in Switzerland in May as part of the US and Swiss investigations into corruption at world ruling body Fifa. Middlesbrough central defender Fernando Amorebieta surprisingly announced his international retirement last week.